Last week was one of those where every client work day involved books. One client purged more than a half dozen boxes of books without a second thought. Another wanted to keep everything (even duplicates) because “every old book has value” and yet another wanted them organized by color of binding (that was a first for me!). It seems like the stars aligned when our speaker for NAPO Houston was none other than Adam Schachter of Langdon Manor, who was able to debunk a bunch of collectible book myths. 1. All Books Have Some Value. A book need a lot going for it to be valuable: It needs to be rare, important, in good condition, have a story and be desired. Your first trip to Half Price Books can be quite a wake-up call as to what your collection is worth. 2. Old Books Have Value. Age doesn’t equate value. An old house in poor condition is more likely to be bought and gutted or bulldozed than lived in. 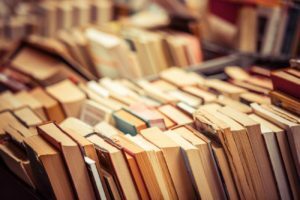 Check an online book aggregate: How many of the same title are for sale? If it’s not scarce, there is no market. An old book is much the same. 3. Autographed Books Have Value. A new book signed by a lesser known (or unknown) author is not worth even getting appraised. If you’re getting a book signed by the author and hope to increase it’s value, leave out any personalization unless you’re also famous (or infamous). 4. First Editions Have Value. Every book’s first printing is “First Edition.” Most books don’t warrant a second edition. 5. Scarce Books Have Value. The narrower the topic and more interesting the topic, the more likely it will be worth something to someone… you just have to find that someone. Old textbooks often have ridiculous prices on resale sites because they’re “scarce.” This is arbitrary because, unless someone is willing to pay the price, the book won’t sell. Side note: the same can be said of art, prints, lithographs, trading cards, etc. No audience, no value. 6. Old Bibles/Encyclopedias/Old Dictionaries Have Value. Again, age ain’t nothing but a number. Most families own a Bible at least a century old amongst them. That’s not to say a Bible doesn’t have a huge emotional value, just not much in the resale market. As an aside, look inside every Bible because you never know what kind of family tree information may be inside. Reference materials printed pre-1900, in great condition and a complete set have a chance of being worth something, but don’t hold your breath! 7. Otherwise Valuable Books In Bad Condition Have Value. Since the late 1800s, hardbound books are printed with dust jackets. No dust jacket means a book is not worth even a fraction as much. Missing pages, water damaged, bug gnawed or the like, it’s likely worth more as kindling. Side note: if you see evidence of bug gnawing on a book, remove it from other books immediately because bugs quickly move on to destroy other books. 8. Big Collections Have Value. Again, the more narrow/specific the topic, the more likely it a collection is worth something. Of course, there are exceptions to all of the above but you should be careful about devoting too much time to resale. You can use book aggregators (like ViaLibri.net and AddALL.com) to get an idea of what your books can fetch but, remember, you are seeing ASKING prices for UNSOLD books. It’s better to contrast asking price with sold price by looking at auction records (on sites like SwannGalleries.com, PBAgalleries.com, and HA.com). I’m not saying get rid of your collection because it may not be worth thousands of dollars. I am saying you should only keep what you have space for, love to look at and/or will reread. Don’t hold on to books that aren’t special to you because of some skewed perceived value. Remember, a collector is someone who collects things of a specified type, professionally or as a hobby; an accumulator gathers an increasing number or quantity of an item. If you want a collection, be mindful of the items you’re collecting. *DISCLAIMER: This blog is in no way mean to discredit the valuable knowledge that lies inside the cover. This is purely meant to help ascertain fiscal value. **Credit to Adam Schachter for dropping all the knowledge on me and my fellow NAPO Houston members.